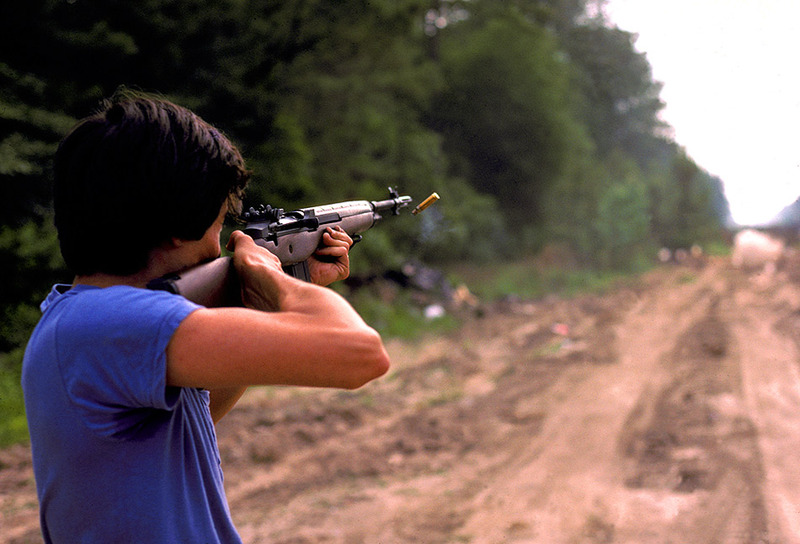 I came across an old Kodachrome slide of a friend of mine shooting my then brand new SA, Inc M1A. This rifle was a special from Springfield, with a NM barrel, NM front sight, and the action was bedded into a GI stock. The rifle also came with an SA, Inc scope mount that I never got around to using. Purchased for 400 bucks and change, which was a lot of money to me back then. The time came when I had to sell something to get a new car, and the rifle went. I've since replaced it, but if anyone comes across serial number 025029, it used to be mine. Shooting alongside of train tracks outside of Sulphur, Louisiana. The box of slides is marked July 1984. Kodachrome 64, Nikon FE, AI Nikkor 50mm 1.8, 1/500th second @ f3.5. Those were the days. That's a pretty cool idea. Although I'm sure you wouldn't get away with it these days. Kodachrome....awesome! Something tells me that all of our digital formats will be long forgotten 25 years from now. Another reason to keep a film camera around for the really important stuff. "Soap box, ballot box, jury box, ammo box. Use in that order." I like the stock, has the f/a cut out. July of '84, if we only knew what we know now! Guess you don't rmemeber what ammo cost were like then do you? I spent nearly all of 1984 at DLI-FLC (Defense Langiage Institute, Foreign Language Center) in Monterey, California studying Russian in the intensive forty-seven week course. 1984...I spent most of 84 at John Hay elementry in Mrs. Clarks kindergarden class. But then of course I might be a 13 year old girl who reads alot of gun magazines, so feel free to disregard anything I post. I was seven. But I played cops and robbers alot. Junior High was hellacious for me in 1984. That's a great photo, Para. It's got some sort of "80's class" to it. For me '84 started in Rota,Spain and ended at Camp Pendleton, CA. Came very close to buying an M1A.... wish I had bought a couple of em. In 1984 I turned 1.
do those appreciate? what would you guess it would be worth today ? I wasn't walking yet in 1984. Very cool picture Para. "Nonsense, I have not yet begun to defile myself." Very cool. That was 1 month before I was born. Very nice. I was reading up on slide to digital converters and the point was made that Kodachrome slides do not do well with the ICE technology that can be used to clean up slides that have dust or scratches. I'm in the process of slowly converting dozens of Carousel trays of slides taken in the 1960s and 1970s to digital form. I did a few hundred some years ago with a flatbed scanner, but it takes a lot of work to do that. I recently bought one of the inexpensive VuPoint dedicated slide scanners, which does simplify the process somewhat, but it still takes too long and its feature to "improve" the picture really messes up night photos. I'm now looking for a better machine. I'd like one that could just use the Carousel trays directly, but so far have not found one. I did find some web postings that talked about hooking a digital camera directly to a Carousel projector, and that technique does appear on the surface to have a lot to recommend it. Not only would it be very convenient (don't have to move the slides around) but it would probably be a lot quicker (cameras take their photos very fast--the scanners take a long time per slide). Of course, cleaning off the slides would still be a problem, and it might not be obvious that it was needed by looking at the result on the small camera screen. When they ask me, "Paper or plastic?" I just say, "Doesn't matter to me. I am bi-sacksual." I was in Kindergarden at Butte View Elementary, Emmett, ID.....same time. Ahhhh...1984. I remember it like it was 24 years ago. I was 10 at the time. I purchased my first gun, a Marlin bolt-action .22LR that I still have, when I was 12. Good times, good times. I was born Thanksgiving day that year. Cool picture.